January 29, 2014 – San Francisco, CA – PipeLineNews.org - Noted scholar, feminist, and psychoanalyst Phyllis Chesler, has written an important book, an autobiography that begins with her harrowing life as a young bride in Afghanistan in 1961 and concludes with a disscussion of the historical background as well as current attitudes regarding Islam. Ms. Chesler’s tale is made all the richer because of the prism of experience through which it flows. While attending Bard College on a full scholarship, Ms.Chesler, an extremely attractive raven-haired eighteen year old, was an intellectual and a devotee of the arts, in her words…an artiste. She was the product of Orthodox Jewish parents and already in rebellion against what she felt was a confining and restrictive upbringing. Today her family might be considered poor, but then they would have been loath to use that word. They were in America and the future was limitless for an intact supportive family with the customary Jewish reverence for learning and scholarship. America could provide a first class education and then, for those willing to work harder, with scholarships for further study. While at college she met her Prince Charming, a handsome Western educated secular Muslim from a far away and exotic land, a man who claimed that he wanted to liberalize his homeland and who shared her love for music, literature, and the arts. They were inseparable despite her parent’s dismay and disapproval. Abdul-Kareem Mohammed was from a wealthy Afghan family. Islam hadn't yet intruded onto the American consciousness and it was well before the time when it became acceptable for women who married Muslim men to tell their horror stories. Ms. Chesler knew virtually nothing about the Islamic faith. Religion was not discussed by the couple, and so the fairy tale life she imagined she was to experience went unchallenged. They lived together for a short while and then married. Their European honeymoon with its visits to the historically important buildings and artistic displays that the Continent had to offer came to an unseemly and premature end when Abdul-Kareem told her that he had to return immediately to Afghanistan, with her in tow of course. Shortly after landing in Kabul and being greeted by his large family, an airport official demanded Ms. Chesler’s passport. Having been assured that this was a normal procedure and that it would be returned shortly, she complied. At that point, as she would soon learn to her great dismay, she became her husband’s property, a citizen of Afghanistan and lost the protection of the American government. The US embassy in Kabul refused to return her passport making safe passage back to the States impossible. Her father-in-law, though courtly and polite, was the unquestioned head of the extended family. His word was law, never to be questioned or defied. He literally held the power of life or death over his family and certainly controlled their fortunes. She learned that he had three wives and many children. It quickly became apparent that her husband’s presumed wealth was really his father’s. His lavish lifestyle was only good until his Western education had been completed. Outside of his father’s wealth, he was penniless. It was a hard to believe that none of the late night conversations she had with her husband to be prepared her for the reality of life as a woman in Afghanistan. Her soul-mate was replaced by a very distant husband, unquestioningly deferential to his father and by custom, usually in the company of men. Abdul-Kareem's life was full of contradictions; despite being educated in America, he began to speak disparagingly about it and his dream of a liberalized Afghanistan could never be reconciled with reality. She was shocked to learn that Afghan women of her status do not go out alone and when they go out in the company of others, they must be dressed in a manner consistent with Islamic dictates and reflecting the expectations of her class status. But even this limited freedom was discouraged as she came to realize that she would never be allowed to experience the country as a free-spirit. Though her husband continued to dream of becoming important, he knew that his father would have the final decision. Lesson learned, in Afghanistan, the individual is viable only within the context of the family. Visiting the American Embassy for relief was fruitless; clearly the officials there wouldn't intervene in her increasingly desperate situation. The matter was straightforward, they said, she was a citizen of Afghanistan and was on her own. Casual cruelty wasn’t only directed at servants and upon rare occasion, almost immediately after landing in Afghanistan her husband began to physically abuse her. Learning of her desire to escape, he raped her, knowing that conceiving a child would make leaving even more difficult. Unable to adapt to the Afghan diet and subjected to abuse, her health began to fail which resulted in her contracting Hepatitis, a life threatening disease. Getting progressively worse and prompted by her constant pleas, an Afghani doctor made a house call. Rather than showing the concern which was indicated by her physical state, he instead dismissed her symptoms. When the opportunity presented itself to finally see an American doctor, he said she was seriously ill and might well die if she didn't immediately leave the country for treatment in the U.S. Beyond despair, unable to walk and certain that her pregnancy would end her life, her father-in-law relented, telling her that he was aware of her strong desire to leave the country and that he thought it would be in the best interest of his family if she left Afghanistan immediately. He suggested a six month visit America and to that end he had secured an Afghan passport. In a short time she was repatriated, free again. There was, of course, a period of adjustment following her return. Her medical condition resulted in a miscarriage which exacerbated her already fragile health. Her experience in Kabul represented the loss of a dream, not to mention her child-like innocence. Though not physical losses, the psychological toll was immense – a steep price for the impetuous actions of her youth. Unbelievably, despite all that had transpired, her estranged husband refused to give up. He pursued her with telephone calls, telling her of his love and of the exciting life she could now share with him in Afghanistan. He refused to admit guilt for his pre-marital lies, albeit lies of omission, nor would he acknowledge the prison she endured except to place the blame on her. Ms. Chesler’s legal counsel decided that an annulment would be the best way to end the marriage. They based the argument on Abdul -Kareem’s deception and claimed that he had promised to live in the United States, to adopt Western ways and to convert to Orthodox Judaism. When the annulment was granted she still didn’t realize that even an accusation of the desire on the part of a Muslim to leave the faith could often be considered a capital offense. Ms.Chesler also failed to realize the totalitarian nature of Afghan society and underestimated the difficulty her former father-in-law would have when she kept the passport he had obtained for her. Reinvigorated, she returned to school, finished her last semester of college and then went on to graduate school. There she felt out-of-place, so much older in experience than her classmates and their idealized vision of what Islamic societies were like. “An American Bride in Kabul” teaches the reader much about of the history of Afghanistan. But even her experiences in the trenches, so to speak, didn’t prepare her as the increasingly brutal inter-tribal fighting, that seems to be the national sport, came to greater public attention. Given the treachery that is endemic to Afghani life in particular and often times, Islamic life in general, how, she wondered, could Abdul Kareem have ever believed that he could succeed in his quest for reform? But there was a psychological aspect to all of this - Abdul Kareem wanted to attain a position that would permit him to preside over the liberalization of his country. Yet, he couldn’t see or empathize with the suffering of his wife, nor could he acknowledge the Islamic norms which dictated the virtual imprisonment of his wife. Such shortsightedness is not a random fault, to the author it appeared to be an affliction of Muslim men, with Abdul-Kareem offered as exhibit “A.” Their creed does not encourage self-examination. Instead it attributes blame for failure to outside forces, making the occasional case of emancipation within such a setting a comma in history. In Afghanistan as in other Muslim countries there are two loyalties. The first is parochial and the second religious. The tribal configuration of family life ensures that progress will be non-existent or stunted should it appear. Tribes have a built-in opposition to innovation, initiative and strategic planning. The brutality of normative Islam almost insures that vis-à-vis human rights, the country will stay locked within a 7th century mindset. Granted that brutal tribal life exists in other societies absent Islam. But whatever motivating force drives these tribes, it doesn’t have the imperialistic/messianic force which motivates the Muslim world. When Mohammed imposed Islam he did so on a society that grew out of a violent Bedouin culture. In many way Islamic theology is closer to the Pirates Code than it is to either Judaism or Christianity. It lays a thin veneer of civilization over a backward social structure. It’s difficult to see how Islamic law, Shari’a, can be made compatible with classical Western liberalism. Chesler’s study of Afghanistan and the Muslim world in general made her aware of the suffering of Jews and Hindus under their rule, finding it beyond ironic to discover that the family she had married into owed its fortune to Jews who had it stolen from them through the machinations of the state. She also became aware of the collaboration between Afghanistan and Nazi Germany. There was a large German presence in Afghanistan even before the Nazi collaboration as the rulers of Afghanistan reached out to Germany to build an infrastructure. Chesler’s declaration of faith - under great duress - during her captivity left an indelible mark on her conscience. In a strange twist of fate following the Soviet invasion of Afghanistan, it was her former husband, his second wife and children who were forced to flee the country. Ever the intrepid researcher, Chesler met up with and interviewed her ex at great length. The content of that discussion comprises one of the most compelling parts of the book and readers might find themselves revisiting it, just to make certain that nothing has been missed. After 9/11 members of the American Afghan community were sought out for interviews by the media, the author was shocked to find that the small Afghan Jewish community in America was willing to rewrite the tormented history of their people in Afghanistan. Perhaps motivated by a false sentimentality, they whitewashed the treatment suffered at the hands of the Muslim majority. Since her trial by fire, Chesler has been an active voice speaking out against the horrific Islamic practice of “honor” killing, which are becoming more common even in the West. The author has little tolerance for Muslim apologists who try to conflate honor killing with domestic abuse and with those who claim that America brought 9/11 upon itself. Though admittedly left-of-center politically, Chesler has nonetheless has remained a thoughtful and authoritative voice regarding the Muslim world. 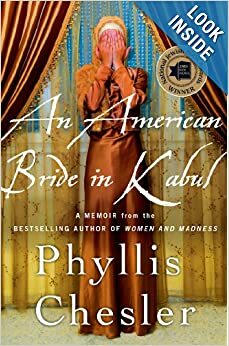 Readers of “An American Bride in Kabul” will discover a wisdom borne of a uniquely personal and heart breaking experience.